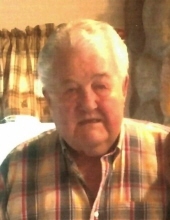 Peter G. Morgan, 80, of Minocqua, WI and formerly of Rosendale, WI, passed away Friday, January 18, 2019, at his home. Pete was born to parents Levi and Caroline Morgan, on March 14, 1938, in Fond du Lac, Wisconsin. Pete graduated from Rosendale High School and married his beautiful bride Karen Tabbert two years later. He began his career working at Speed Queen in Ripon, WI where he and Karen had their first child, a son Matthew. Pete had been in the National Guards since high school, and in the fall of 1961 he was called up and left for Fort Lewis in Washington. Three months later Karen and Matt joined him in Washington. Pete earned an expert marksmanship badge while in service. The Berlin crisis ended quickly and back to Wisconsin came the family. He and Karen were soon expecting their next child who was very sadly lost in childbirth in 1963. Here is when Pete began his career in agriculture, and began to work as manager for IMC in Eldorado, Wisconsin. Within the year along came their daughter Jackie. With the family growing, Pete turned his interest to farming and purchased land from his in-laws Arthur and Leone Tabbert. This eventually led to his love for working the land and driving tractors. Remember his stories of his old John Deere 4020. He and Karen moved to Minocqua in the early 90’s and have been enjoying life “On Golden Pond”, as he would always say. His most recent career was in real estate, where he actually owned his own agency in Minocqua for over to 20 years. While in Minocqua, his most precious times have been spent enjoying his family. He loved his three grandchildren, from swimming with them in the lake to playing cribbage. He was such a proud grandpa. Throughout his life, he has had a profound interest in sports, hunting and fishing and all things outdoors. His passions included watching the Green Bay Packers and Milwaukee Brewers, and listening to Bob Uecker who he was fortunate enough to meet while on a vacation. Peter is survived by his wife Karen Morgan, son Matthew (OJ) Morgan and daughter Jackie (Jeff) Holmes. He is also survived by his three grandchildren, Jess Morgan, Mallorie (Sam) Munson, Michaela Holmes and a great grandson Levi Munson. Additional surviving relatives include his sisters-in-law Mary Ann Michler, Judith (John) Kurth, along with numerous nieces and nephews. He was preceded in death by his parents Levi and Caroline Morgan, infant son, mother and father-in-law Arthur and LeoneTabbert and brother-in-law Donald Michler and infant grandson, Justin Holmes in 1994. Visitation for Pete will be held on Wednesday, January 23rd from 9:00 am to 11:00 am at Trinity Lutheran Church in Minocqua, WI with Funeral Services at 11:00 am. There will also be a visitation on Friday, January 25th from 9:00 am to 11:00 am at St. Paul's Evangelical Lutheran Church in North Fond du Lac, WI with Funeral Services at 11:00 am. Burial will follow at Rosendale Cemetery. To send flowers or a remembrance gift to the family of Peter Gary Morgan, please visit our Tribute Store. "Email Address" would like to share the life celebration of Peter Gary Morgan. Click on the "link" to go to share a favorite memory or leave a condolence message for the family.